Strange out of season southerlies were stsomping through the Sea of Cortez wreaking havoc and generally catching folks off guard. 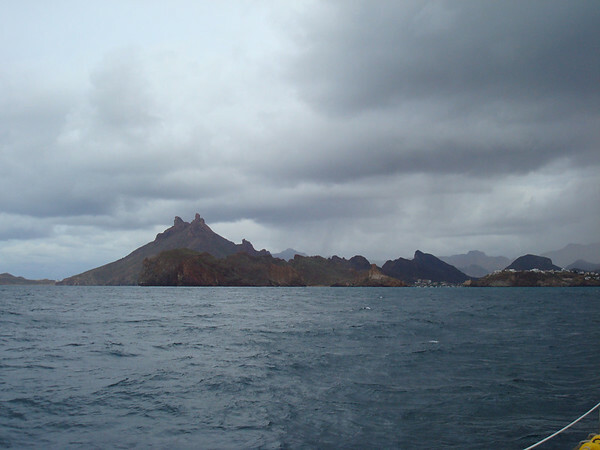 After beating up into the prevailing northerly winds for the past few weeks, we decided to latch onto the tail end of these southerlies and ride 'em due north and across the Sea of Cortez to San Carlos in a spirited and petroleum-free passage by sail. The forecast was for winds out of the southwest 15 to 20 knots all night turning to northwesterlies the next day. So we pulled anchored out of La Ramada cove north of San Juanico, made a heading of zero-zero-zero degrees true and caught a nice 20 knots out of the southwest. This built up to a not-so-nice 25 to 30 knots out of the southwest which we sailed in front of until about 1AM. At almost exactly the half way point between our departure point and San Carlos, the wind shifted. Not in that gradual sort of "hey, did you notice the wind shifted?" kinda way. This was more of the "we used to be pointed at Arizona, now we're pointed at Belize" sort of shift. In a span of 8 minutes (our autopilot was steering to a wind angle, so I later checked our GPS track), the wind clocked from southwest, to due north. Bye, downwind sail. Hello, upwind bash. And with squirrelly winds comes confused seas. Slop. Chop. Green water over the bow. After a few more hours of this, the wind decided to back to the west giving us a better beam reach but with no improvement in the sea state. Coming into San Carlos, we timed our arrival for early morning in case we had problems and needed more time. San Carlos is not a place we wanted to arrive in the dark. With the now very consistent 30 knot wind on our beam, Hello World took off like an angry horse. I kept reefing the sails down, hoping to slow our speed but every time, she'd stomp back up to hull speed. I'd reef some more. Hull speed. I finally arrived at a sail configuration of a napkin-sized mainsail and a placemat-sized jib and we slowed down to 4.5 knots. Turned out, this still put us in too early. So, we hove to about 5 miles off the coast of San Carlos and I caught a catnap in the cockpit waiting for the sun to come up. The sun rose, we sailed into San Carlos, dropped the anchor and augured into bed. Pulling into San Carlos after a long night's journey.